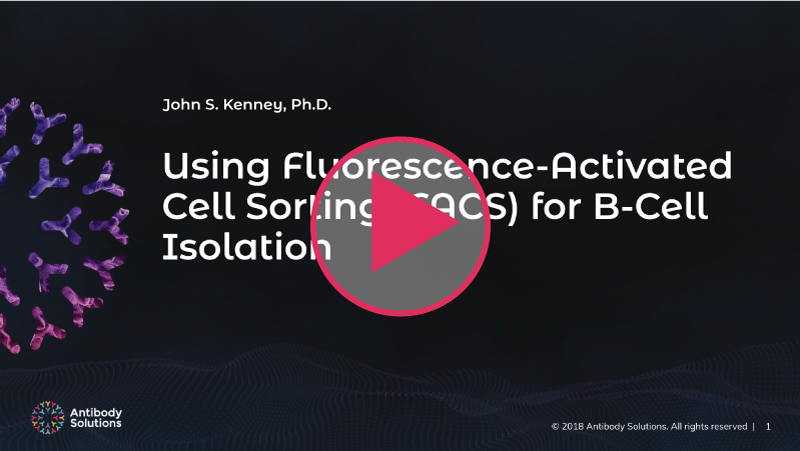 "Using Fluorescence-Activated Cell Sorting (FACS) for B-Cell Isolation"
Originally presented on Wednesday, October 24, 2018, John Kenney, PhD, Antibody Solutions' president and co-founder, presents our most recent research findings(*) on the benefits of using a FACS-based approach for B-cell isolation. Please complete and submit the form to the right to download our presentation and watch our webinar. Surface immunoglobulin (SIg)-bearing B cells and antibody secreting cells (ASCs) e.g., plasmablasts or plasmacytes, are two populations within the germinal center for isolating high-affinity, antigen specific antibodies. Using Fluorescence-Activated Cell Sorting (FACS), SIg cells may be identified by Ag-staining of SIg, whereas ASCs require capture of antibody secreted by the cell prior to Ag-staining. This research demonstrated the utility of a FACS-based approach for isolating cells from either population. TOPIC: "Using Fluorescence-Activated Cell Sorting (FACS) for B-Cell Isolation"
© 2018 Antibody Solutions. All rights reserved.